Southern California Gas Company (SoCalGas) has announced the company will be one of the first natural gas utilities in the US to incorporate innovative fibre optic cable technology to detect impacts and leaks along its transmission and high pressure pipeline system. The technology uses fibre optic strands to transmit data across long distances, and can send early warning of pressure changes or vibrations that could indicate a leak or an impact to the gas line. The technology quickly detects when abnormal stress, movement or temperature conditions are present. Continuous monitoring and measurement will help the company quickly identify threats to a pipeline from heavy equipment operation, unexpected earth movement, or physical impact. When a threat is identified, information will be sent within seconds along the fibre cable to a remote monitoring station. The system can pinpoint where a potential problem may be developing within 20 ft. The system can prevent pipeline damage from unauthorised construction work, geologic conditions or other physical changes like structural stress from broken water mains. It can also detect pipeline leaks through both sound and temperature signal analysis. Access to immediate and area-specific data will give SoCalGas crews and first responders more time to plan, allocate resources, and take effective actions to mitigate leaks or potential leaks. The system works on the principle that light signals vary when a fibre optic cable is exposed to vibration, stress or an abnormal change in temperature. The advanced technology helps operators interpret these signal changes and determine the type of threat posed and the precise location along the continuous length of cable. In some cases, operators will be able to distinguish hand digging and routine traffic from heavy equipment use near the pipeline. 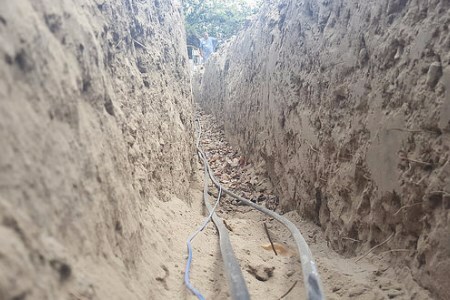 To test and gain a better understanding of how the new system performs, engineers at the company's Pico Rivera test facility created a working scaled-down pipeline section and installed fibre optic cabling in a pipeline trench. Personnel pounded and dug into soil, pavement and other surfaces, drove heavy equipment over and around the test area, and simulated gas leaks of various magnitudes. From a remote location, special monitoring equipment successfully identified each of those activities by its unique data signature. SoCalGas plans to install fibre optic cable along all new and replacement pipeline segments 12 in. and greater in diameter and one mile long. The fibre optic cables will be installed approximately 36 in. below the ground surface and 12 in. above the pipelines. SoCalGas plans to install its first fibre optic cables on a 7 mile stretch of pipeline in Bakersfield this year. Incorporating fibre optics into its operations is part of SoCalGas' long-standing commitment to enhancing the safety and reliability of its more than 101 000 miles of natural gas pipelines.